If you are still on the fence on what your wedding florals are going to be, we have some marvelous ideas for you form Signature Bloom. From the sweet and lovely garden bouquet all the way to an elegant vintage number for all you hopeless romantics out there. 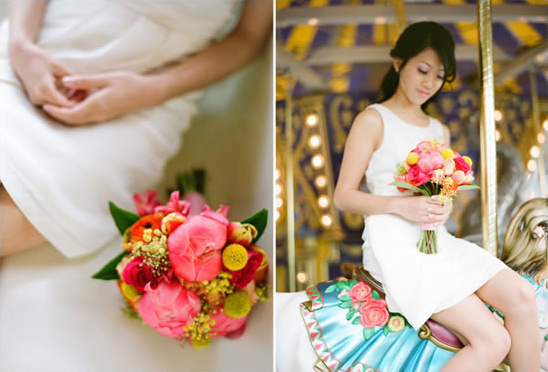 Each bouquet is described perfectly so you can share with your florist your exact vision. All photographed by Lacie Hansen. 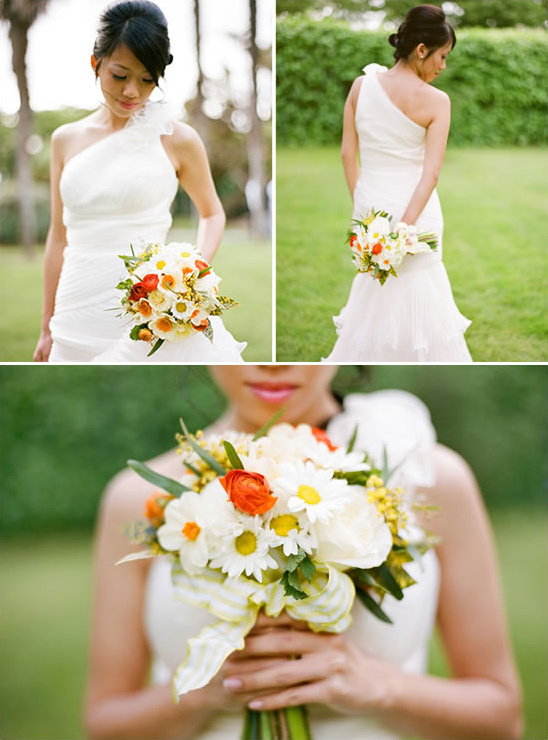 Be sure to see the full gallery of wedding bouquets here. Spring garden daisy wedding bouquet for a rustic casual garden wedding. 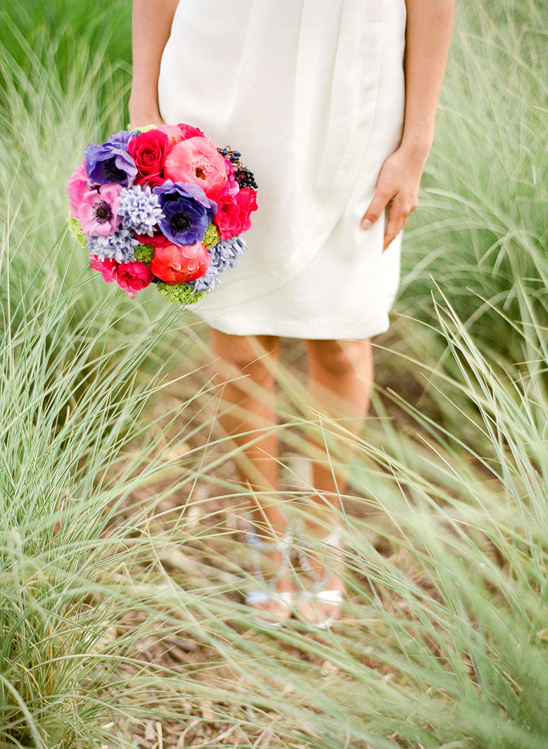 Soft and loosely arranged, this bouquet looks like it came straight from the garden. It's perfect for the sweet bride that loves Daisies. Garden roses and fragrant herbs add fullness, texture and scent while the bow finishes the bouquet with nice country flair. 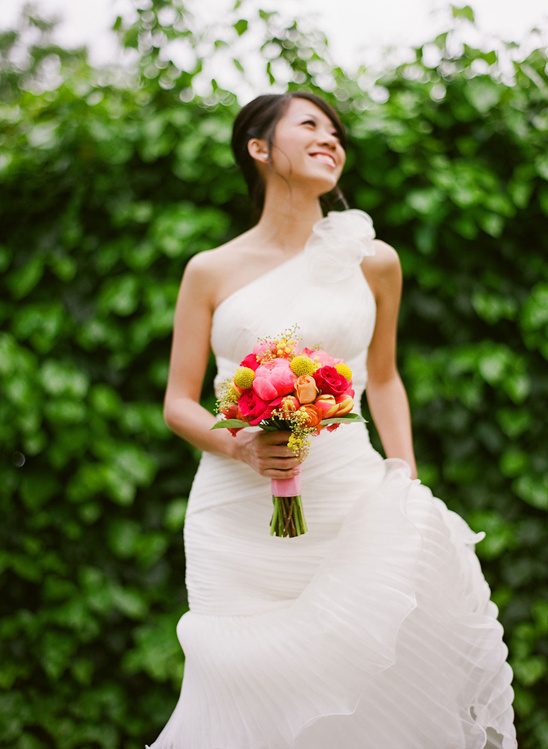 Peony wedding bouquet for the modern bride looking for pops of color. This bouquet is sweet and innocent, yet playful. The Peonies look so delicious; they almost look like cotton candy. 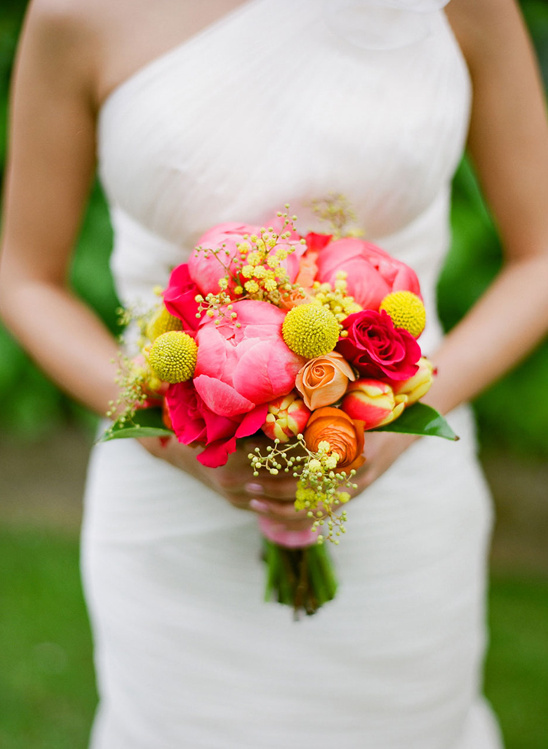 The vibrant hues of yellow, coral and hot pink blend nicely together; making this an ideal bouquet for a summer wedding. A classic spring bouquet complete with berries and major pops of color. Spring inspired bouquet featuring some of the best flowers of the season. Anemones and Peonies open beautifully and the Hyacinths with their signature sweet fragrance are the stars of this beautiful composition. A few Hyacinth blossoms will do since the scent is so strong. For a pop of color, add some lime green Viburnums to this classic bouquet. 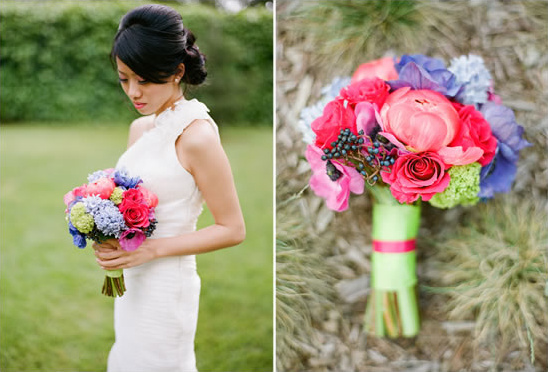 Flowers: Anemones, Roses, Peonies, Hyacinths, Viburnums and Viburnum berries. 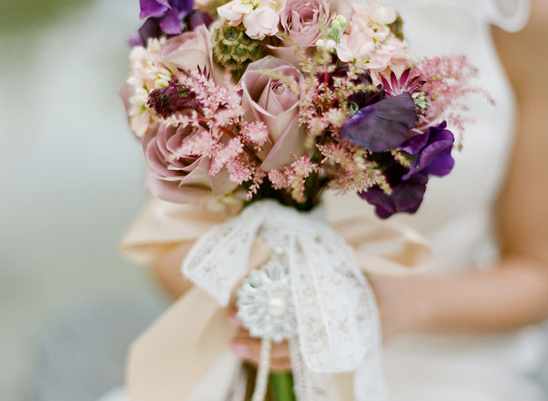 A romantic vintage bouquet with lace and pearls. 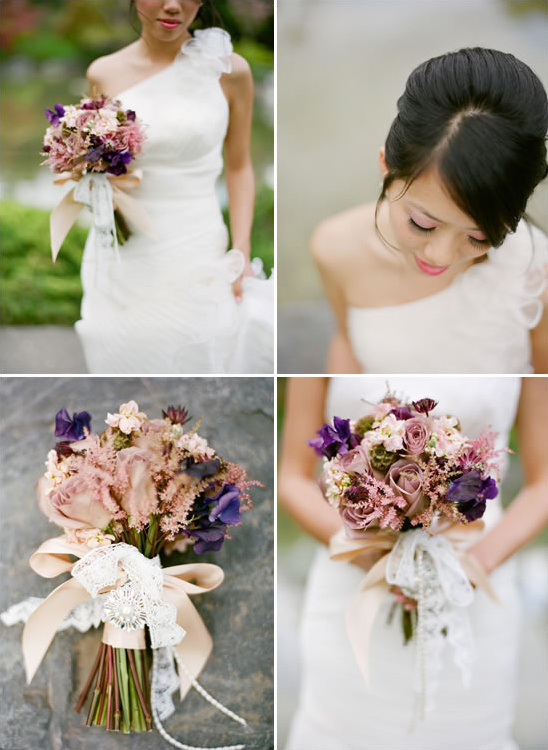 This romantic vintage bouquet has an understated elegance. Instead of real feathers, Astilbe is used to add a pretty soft, feathery texture to the bouquet. The white lace is a nice contrast to the flowers and the brooch and pearl strands add some personal touches.